As much as I adore skin care basics and skin care layering, my latest obsession has been with masks! I truly find that using sheet masks and treatments like peels can boost the results of my standard skin care regimen, so today I will share my favorites from Nordstrom. Some of these are more budget friendly and others are substantial splurges, but all of them are true gems. All details after the jump! I purchased mine in Japan, but the Asia-exclusive Kiehl's Clearly Corrective Masque is now available exclusively at Nordstrom for a limited time! I plan to stock up on a few extra boxes because the performance of this brightening mask is truly that impressive. Apparently, one use of the mask rivals the results seen with three weeks of twice a day usage of the Clearly Corrective Dark Spot Solution. 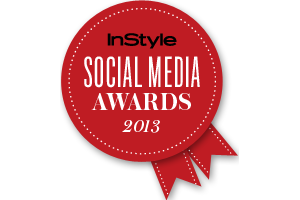 I did not expect the results to be dramatic, so I really did gasp at the results the first time I tried it! My skin definitely appeared more even-toned and my acne scars appeared fainter. Furthermore, you won't have to worry about pilling because the serum absorbs and dries down completely without leaving a film on the skin. That makes the Clearly Corrective Masque a perfect complexion pick-me-up before makeup application, so I now reserve this for use in the mornings. When my face is bloated or swollen, I pop the mask in the refrigerator for thirty minutes before application to de-puff the skin. At the price of $9.60/sheet, I have yet to encounter a mask that can outperform this. 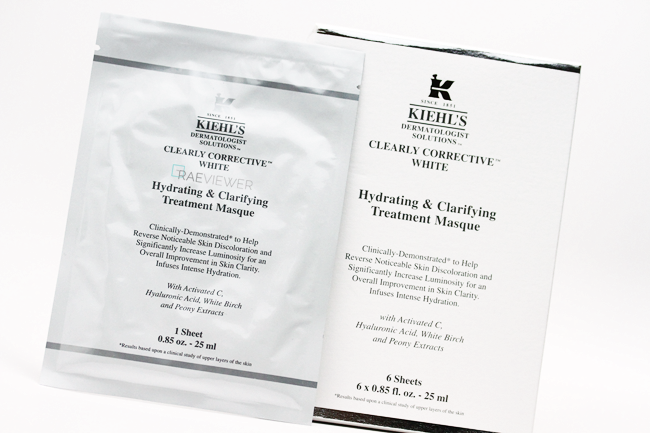 I highly encourage you to try the Kiehl's Clearly Corrective Masque if you have any discoloration and/or acne scarring! Note: the cotton is quite sturdy, not quite as soft as SK-II's FTM or as plush as SK-II's BDRM. 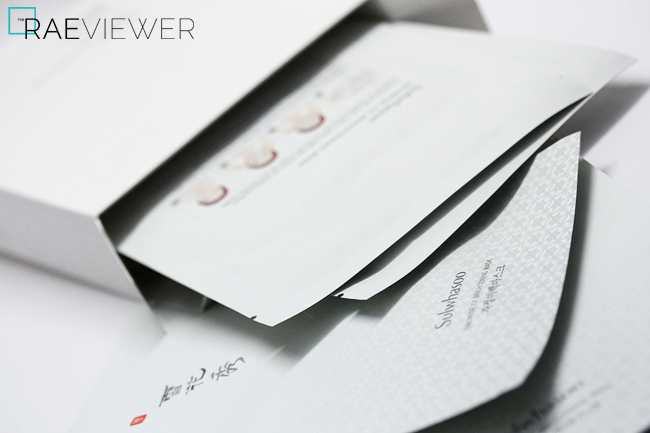 The Sulwhasoo Snowise EX Brightening Mask will feel peculiar to many, as it has a texture similar to real skin. 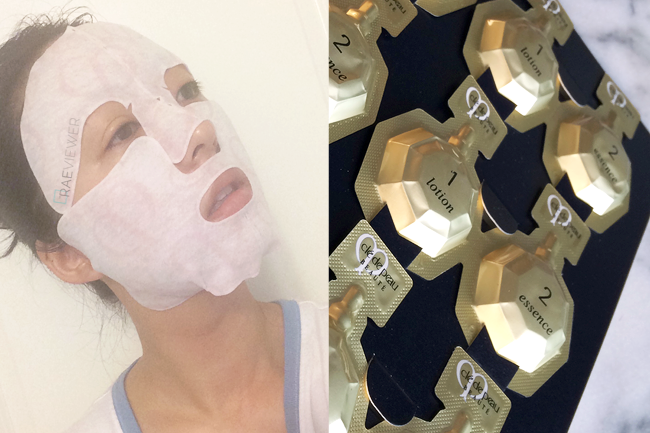 Each mask ($13/sheet) is made of compressed plant pulp and is actually fermented in white ginseng for 2 weeks. This is the only sheet mask I use that comes packaged between two layers of mesh, so I figured an explanation would be helpful. 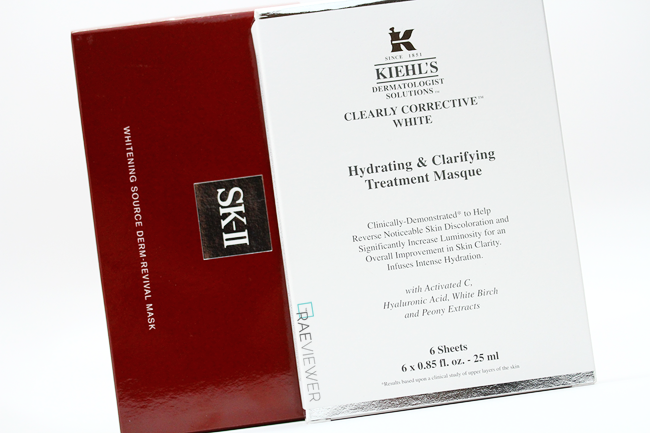 Since the gel mask is so delicate, the mesh is necessary to prevent tearing or disfiguration. Carefully remove one side of the netting and apply the mask to the face, aligning the eye and mouth cut-outs. Slowly remove the other side of the netting and adjust as necessary. 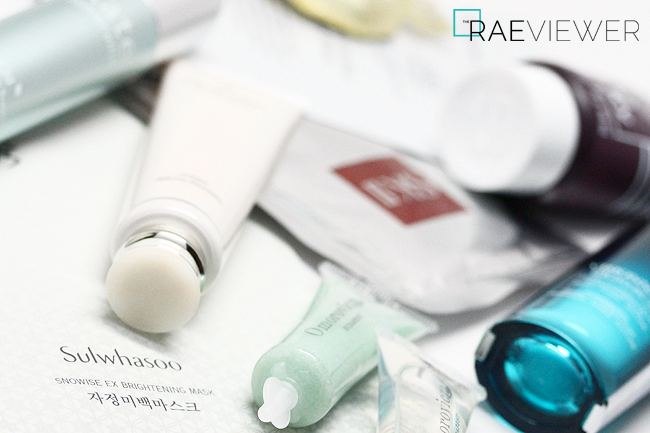 Leave the mask on for 20 minutes and massage in the excess serum after removal. This Snowise mask might feel slimy at first, but it adheres and clings to the skin like no other mask I have ever tried, which makes it easier to use! These brighten well, but the Snowise Mask is the absolute best at reducing redness and inflammation from acne. Whenever I see cystic or hormonal acne flaring up, I pop one of these Snowise masks on and see dramatic results. Don't just reserve them for occasional acne, though! I use these twice a week to keep my skin in check. The complete Sulwhasoo range is now available at Nordstrom, so I hope this will encourage you to try my favorite Korean skin care brand. 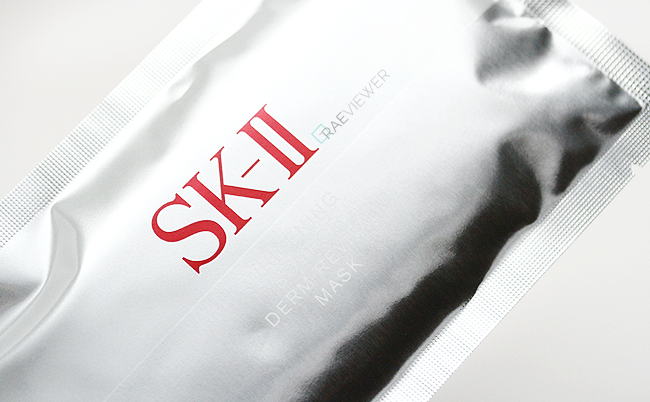 Many of you already know how much I adore the SK-II Whitening Source Derm Revival Mask. It clarifies and moisturizes the skin while creating the most translucent glow possible. My mother introduced me to this mask, and I have become a staunch advocate, too! My skin is visibly brighter and hydrated, and my acne scars fade with every application. It is an investment at $17 per sheet, but it is one of the most potent whitening/brightening treatments on the market. These masks also use the most plush, luxurious cotton cloth and come drenched with serum, so they really feel like a special spa treatment. This is one of the few masks that features eye flaps, so I light a candle, play some music, close my eyes and relax on the couch with my puppy Beau in my arms for 15-20 minutes. I use these Derm Revival masks once or twice a week, and I look forward to each indulgence. 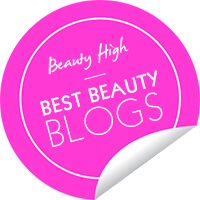 Do not throw out the excess serum; squeeze it out and massage it into your face or body! You can even reapply the mask to your neck or feet after using it on your face, but please do not stick the used mask back in the pouch to save for another day. It seems economical, but it is unsanitary and the cotton will degrade (the same applies to the FTM below). 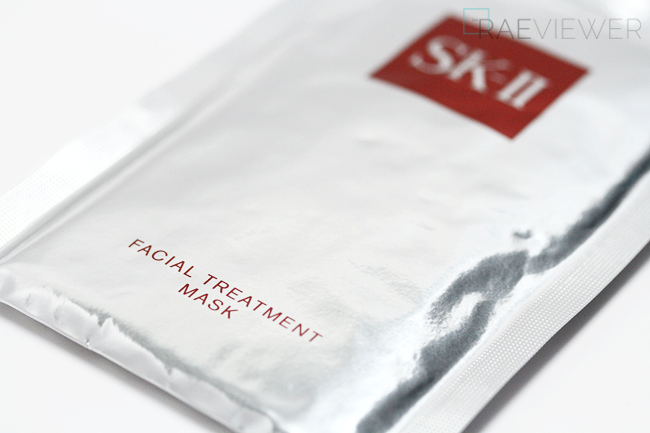 While the Derm Revival mask is a multi-power brightening player, the SK-II Facial Treatment Mask is the best in-flight treatment I have ever used. My normal to dry skin can become dehydrated easily, so I always travel with a few of these masks. Yes, I use them on the plane and do not care what anyone has to say about it! This heavy duty moisturizing treatment is lightweight but remarkably effective and safe for even sensitive skin. If you are acne-prone and are concerned about committing to a box, try a single treatment for $17! When you buy a box of 10, however, each mask is priced at $13.50. I like to leave these in the refrigerator and use them in the evenings to cool down after a stressful day. These also come saturated with extra essence, so I like to apply the excess on the driest parts of my body, like my hands, elbows and knees. With regular use, these Facial Treatment Masks will improve the texture of your skin and help makeup sit better throughout the day. There's a good reason why brides in Japan use one of the masks every night for 90 days before their wedding! It works. The Clé de Peau Illuminating Concentrate is a three-step treatment process to hydrate, illuminate, and plump up the complexion. This is quite a treat for the skin at $25 per use, so I like to reserve this for special event prep prior to makeup. Cleanse the face and saturate a cotton pad with the lotion, one of the most nourishing formulas I have ever tried! Allow the lotion to dry completely and wipe the face a second or even third time if you have extra dry skin. Then take the essence, a light pink cream, and smooth it over the face and neck. Massage any remaining essence in the foil pod to special areas of concern, like around the eyes and mouth. Then I prep the mask. 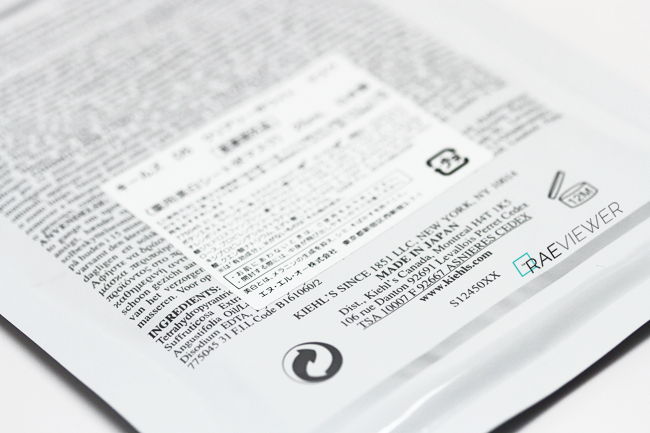 Each packet contains the upper and lower parts as individual sheets, so I remove the backing of the upper first and use the perforated line as a guide to position the mask perfectly over my nose. I take the bottom half of the mask with both hands and cup my jaw for a secure fit. These masks are outstanding — unlike any I have encountered. The outer cotton is stamped with pink Clé de Peau logos and feels like cashmere. The other side is coated with an iridescent pink gel formula, which is quite unusual but highly effective! The first two steps ensure my skin is soft and hydrated, while the mask immediately infuses my skin with radiance and gives my skin the look and feel of resiliency and bounciness. 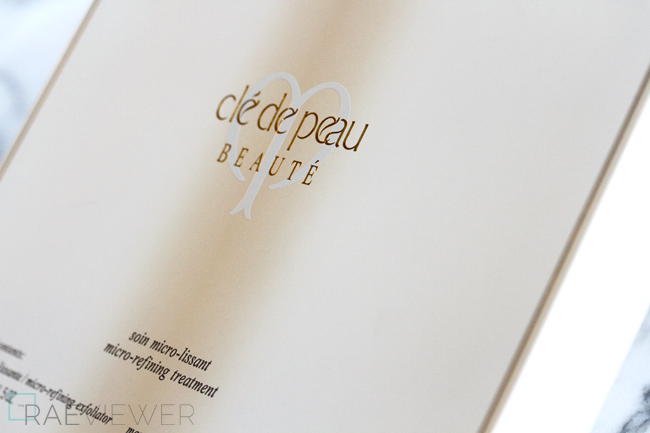 If you suffer from dullness and lack of firmness, you absolutely need to try this Clé de Peau Illuminating Concentrate! It's a must-have in my travel kit. 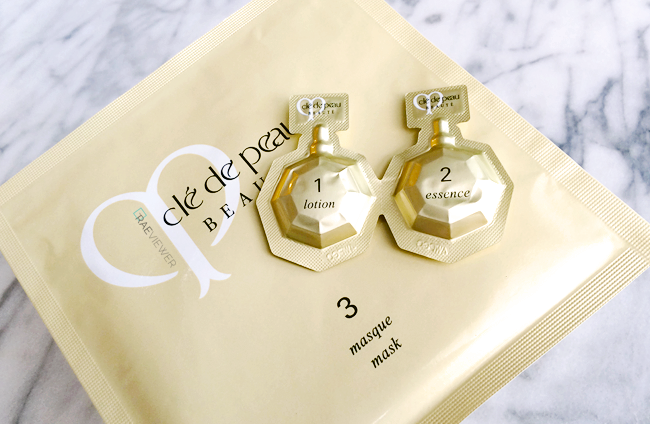 The Clé de Peau Micro Refining Treatment is positively one of the very best exfoliating treatments on the market. It feels like a spa treatment! First, apply two cherries' worth of the micro-refining exfoliator to freshly cleansed skin and let it sit for three minutes. Then lightly moisten the face with water to activate the exfoliating micro-particles and gently massage the skin for one minute. The texture is a superfine grit, so think of it as a creamy luxe polisher that gently sloughs away dead skin cells without drying or irritating the skin. After rinsing away the exfoliator, apply the two-piece mask. I was hesitant at first because the mask feels rather dry to the touch, but ten minutes later, I was utterly amazed at how efficacious it was! Upon removing the mask, my skin felt thoroughly rejuvenated and looked dewy soft. I have normal to dry skin, and no additional moisturizer is required whatsoever. 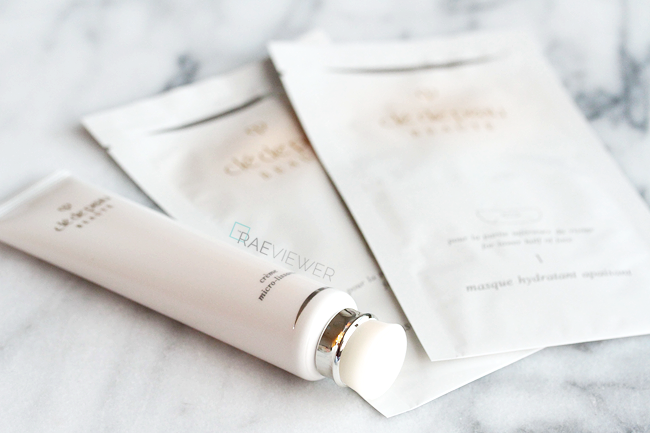 If you are looking for a re-texturizing treatment that also brightens and pampers the skin, look no further than this Clé de Peau Micro Refining Treatment! It is a hefty $33 per application, but it is worth every penny since I use it once a week in place of my usual nighttime skin care routine. The Omorovicza Cooper Peel is an exceptional at-home peel. 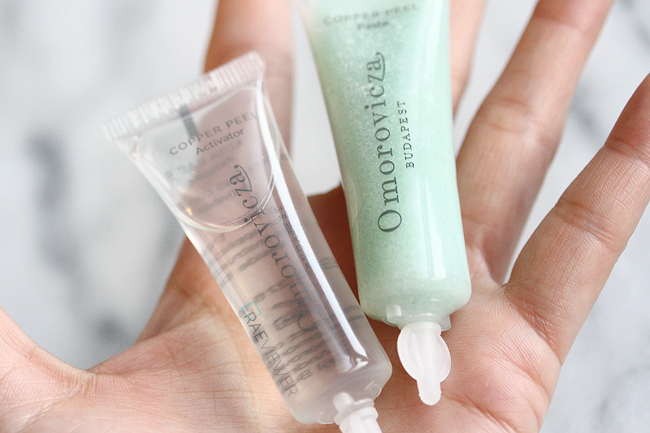 Some are more comfortable with manual exfoliation like the Clé de Peau Micro Refining Treatment above, but this Omorovicza Copper Peel is a marvelously quick and easy dual-phase treatment. It's also far more affordable at $20 per usage (or less since many find each tube is capable of 2 or even 3 applications), but it does not replace your evening skin care routine. I recommend using this once a week or twice a week, and it will aid in maintaining the benefits of the intensive CDP treatment! 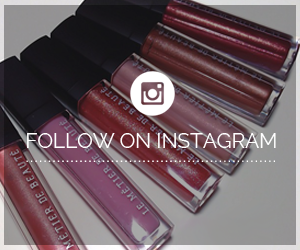 The Copper Peel utilizes mineral cosmetology, a patent protected mineral delivery system developed by Omorovicza. It enables an unprecedented level of absorption of minerals by the epidermis and the dermis for firmer, suppler, and younger looking skin, so try using this on patches of acne scars — not just all over the face. The blue copper paste is first applied to clean skin and gently massaged using circular motions to buff away dead skin cells. After exfoliation is complete, use the lactic acid activator. 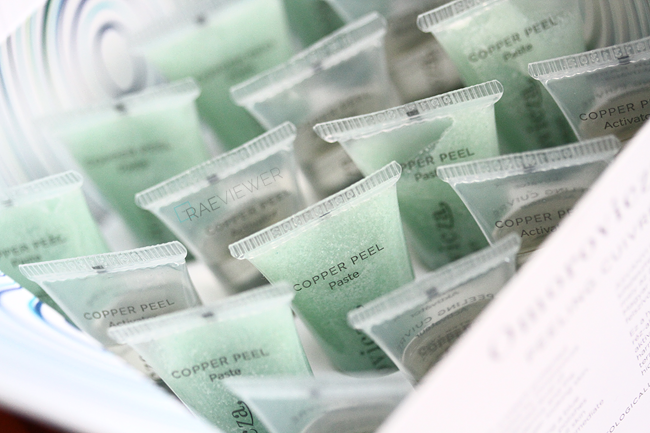 Apply the clear gel on top of the Copper Peel paste, which will produce a white lather. Gently massaged into the skin for two minutes to polish and smooth the complexion and rinse thoroughly. No more dull skin! Just make sure you follow up with a sunscreen with SPF50 PA+++ to prevent any sun damage. 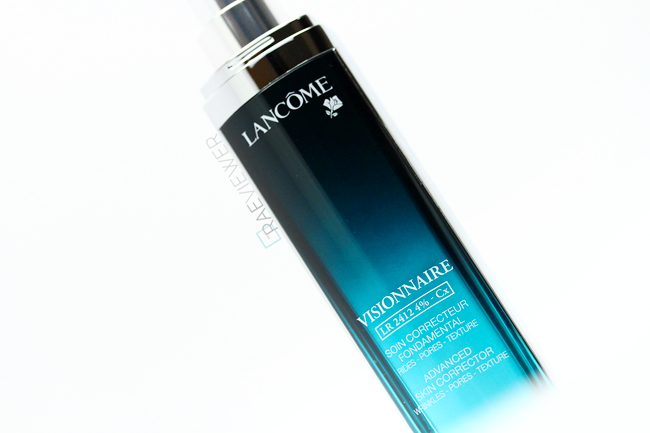 I have recommend the Lancôme Visionnaire Skin Corrector ($79) countless times since its release several years ago, and I have all my girl friends with combination skin and oily addicted to it. I've lost count of how many bottles I've repurchased as gifts! The recently launched 2nd generation has a 4% concentrated formula — an upgrade from the original 2% — so if you had reservations about Visionnaire before, now is the time to take the plunge and give it a try. The skin never feels greasy because the formula absorbs quickly. It also makes the pores far less visible without clogging them, so I prefer to use this in the mornings in place of a foundation primer. 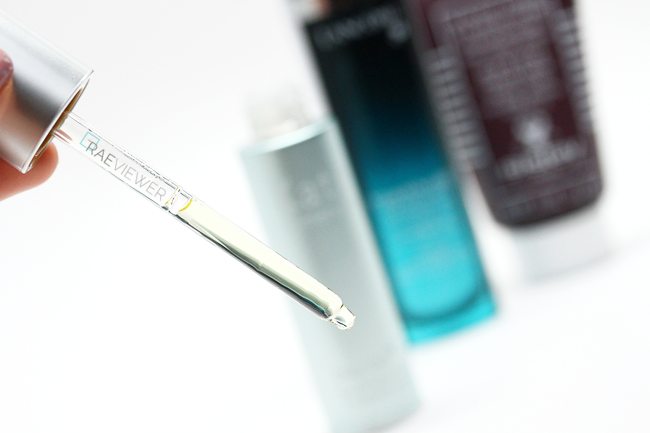 When used overnight, Visionnaire actually softens and smoothes the skin. Use morning and night for best results! P.S. Visionnaire is an affordable alternative to my beloved SK-II Cellumination Aurabright, though the difference in brightening results is quite drastic. 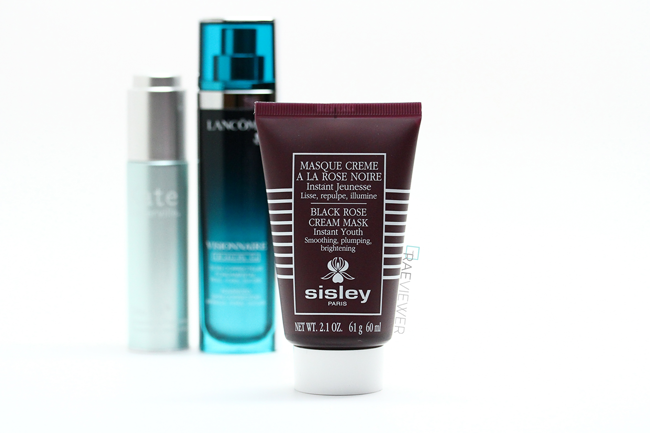 The Sisley Black Rose Cream Mask ($162) is a cult classic. The formula is non-comedogenic and suitable for all skin types. If you have a normal, dry, or dehydrated complexion, however, you absolutely need to try this! I usually prefer sheet masks, but this Rose Cream facial mask is lovely. Apply a generous layer to the face and neck, avoiding the eye area. Leave on for 10 to 15 minutes and wipe away the excess product using a Koh Gen Do cotton pad. Some folks with very dry skin will use the Rose Cream Mask as a moisturizer or an overnight mask, but I prefer the traditional method. I tend to use this in the mornings and layer a lightweight serum, moisturizer and sunscreen on top. It really does make your skin look plump and feel smooth. The delicious rose scent is therapeutic, too! If you are too self-conscious to use a sheet mask on a plane, try this incognito Sisley mask instead. I started using Kate Somerville's Dilo Oil Restorative Treatment ($65) several months ago, but I only just discovered how extraordinarily versatile a product this is. I can use it alone on my face to plump up fine lines or add it to my body butter to soften my extra ashy knees and elbows. I started using it on the ends of my lightened hair last week, and it has made a noticeable difference in just a few days. Best of all, it's affordable! For best results on the face, use on damp skin. It smells divine and travels well, so the Dilo Oil has quickly become an essential in my travel bag. It leaves the skin dewy but not oily. If you choose to use this in the mornings, wait at least 15 minutes before applying any foundation. Also, keep in mind that the dropper dispenser is rather generous so press down slowly and carefully to prevent wasting precious product! *Wonder why most of these masks are not left on overnight? The truth is, your skin can only absorb so much. to peels/exfoliators. Stick to the directions when possible! Since this was a lot of information to take in, my must-haves for travel are the SK-II Facial Treatment Mask (in-flight), Sulwhasoo Snowise EX Brightening Mask (acne prevention) and Clé de Peau Illuminating Concentrate (event prep). I pack these in my carry-on luggage first! My favorites for regular use are the Sk-II Brightening Derm Revival Mask (acne scarring) and Clé de Peau Micro Refining Treatment (exfoliation). NOTE: Please make sure to use sunscreen diligently to prolong the effects of these treatments. Use SPF50 PA+++ all day, every day (even when it is cloudy outdoors) to prevent wrinkles and sun damage! My favorite is Eve Lom's Daily Protection, but the best sunscreen for combination/oily skin is Shiseido's Urban Environment.